TUI UK promo code 2019: save £10 on all return flights! Flights from European cities to famous Nadi, Fiji from €882..
Easy way to save some decent money using this latest TUI UK promo code on your next flight with this charter carrier. Simply use below discount and save additional £10 on all return flights departing from the United Kingdom! At this moment they offer plenty of options from many airports in the United Kingdom. For example you can fly to Spain already for £39 roundtrip. Also very cheap flights from London to Saint Lucia or Barbados for £269, Cancun in Mexico just £289 or Mauritius £352. Another suggestion are discount deals London, Manchester or Birmingham to Orlando Sanford, Florida for £259 or Cape Verde from £169..You can apply this TUI UK promotion code when booking your flight London, Birmingham, Bristol, Manchester, Newcastle, East Midlands or Glasgow. Fare is for a round trip and inclusive of all taxes and fees. Note that TUI Airways do not offer hold bag in base fare. You can purchase separately for extra cost. How to apply TUI UK promo code. : Simply choose your flight and proceed to last step “Booking”. You will find there separate “Discount code” box where you can enter below voucher. Once you click on apply discount your next TUI flight will be automatically discounted by said amount. (You will see message as below in our booking sample). You can apply this TUI Airways discount code when booking your flight from the United Kingdom from 30th of January to 31st of October 2019. Validity of this TUI promo code is till 31st of January but it might be cancelled anytime soon so hurry up if you want to save and book one of the cheapest flights on some of the route we have ever found..
Booking sample of TUI UK promo code 2019: save £10 on all return flights! As per our booking sample you would depart from London Gatwick to Saint Lucia on 19th of February. Inbound flight from Caribbean back to the United Kingdom on 5th of March 2019. Take advantage of this rare deal and save further with charter airlines. 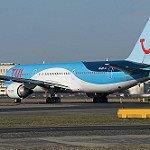 Use special TUI UK discount code and fly cheaper to exotic holiday destinations..